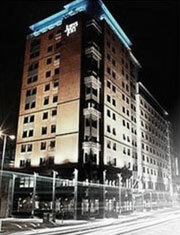 Its location next to Central Station makes the Jurys Inn ideal for overnight visits and events at Glasgow SECC. It’s big, it’s bright and the all-day Costa Coffee adds a savvy expresso touch. The Jurys Inn offers the kind of ‘big’ hearted welcome deals you can expect of the Scots and from what is ostensibly Glasgow City Centre's largest hotel. 321 standard rooms are available to make your stay an exceptional and comfortable experience and boast a variety of luxuries including multi-channel flat screen TV, air-conditioning, high-speed internet access and en-suite bathrooms you can practically get lost in. You may notice that the hotel rooms are generally more spacious than you may find with other chains, a reflection of the sheer size and scale of this magnificent high-rise riverside hotel with its stunning art deco motifs yet practical and entrepreneurial 21st Century spirit. The Jury’s Inn location next to Glasgow Central Train Station makes it ideal for those attending events at the SECC, shows at the Royal Concert Hall and Glasgow's Big Adventure. The Jury’s Inn is adjacent to Glasgow Central Train Station and just a few minutes stroll from Queen Street Station making it ideal for those guests with tight and hectic business schedules.